Barrick CEO Mark Bristow in the field. JOHANNESBURG (miningweekly.com) – Dr Mark Bristow has snapped into fast action wearing the Barrick crown. His Randgold Resources, which now falls under the Barrick Gold umbrella, on Wednesday bowed out with panache when it declared a 35% dividend increase to $2.69 a share, buoyed by record production of 807 000 oz of gold at the Kibali mine, in the Democratic Republic of Congo, and record throughput at the Loulo-Gounkoto mine in Mali. Barrick simultaneously announced a 33% increase in annual dividend on full-year gold production of 4.53-million ounces at all-in sustaining costs (AISC) of $806/oz. Barrick’s full-year copper production was 383-million pounds at AISC of $2.82/lb. Bristow believes that the new Barrick has the ability to grow through its large exploration portfolio and geological capability, brownfield extension at existing mines and new projects destined to become tier-one mines, driven by a management team with a skills and experience mix that, in his view, few other gold mining companies can match. The company said in a media release to Creamer Media’s Mining Weekly Online that Bristow had already visited some of Barrick’s operations in the Americas twice and established regional executive teams for Africa and the Middle East, North America and Latin America. He is guiding Barrick’s 2019 production at between 5.1-million ounces and 5.6-million ounces and its copper output at between 375-million pounds and 430-million pounds. During 2019, the reserves and resources of newly-acquired Randgold will be combined with Barrick’s on the basis of common calculation criteria, and will be reported on that basis at the end of the year. 'Tier one' is the sought-after status for the assets of the new combined entity. The core African assets – Loulo-Gounkoto and Kibali – make the tier-one cut with margin to spare and are reportedly maintaining the grade of their reserves. The feasibility study on the Massawa project in Senegal has been completed, and an application for a mining permit has been submitted to the government. Discussions with the Tanzanian government on the impasse regarding Acacia are continuing. Delivering efficiencies, the company reports, are the combined Nevada assets that take in Turquoise Ridge, while the recent Fourmile discovery, also in Nevada, has been combined with the nearby Goldrush in a single project with tier-one potential. Shaft sinking and construction at Turquoise Ridge is on track, along with a focus on improved efficiencies and cost discipline. 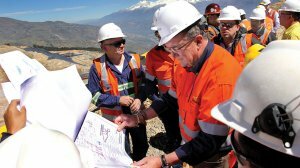 In Argentina, a concerted effort is under way to drive Veladero back to tier-one status as Barrick looks to expand its Latin American business. At the Pueblo Viejo mine in the Dominican Republic, a scoping study supports the expansion of what is already a large opencast gold mine. Unsurprisingly, geologist Bristow, who built Randgold Resources on a discovery and development strategy, has renewed focus on exploration across the group’s Latin American portfolio. Bristow sees enormous upside in Nevada through brownfield extensions, new discoveries, and combination opportunities with other operators in the area.